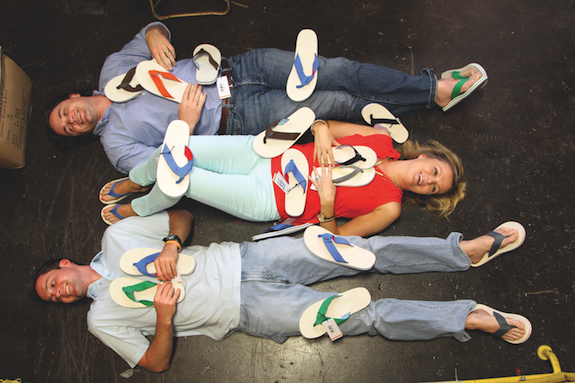 Hari Mari is a flip flop company started by two Highland Park High School grads, and a St. Mark alumnus. Made for women & men, Hari Mari is a hue-driven and comfort-focused flip flop line, constructed with versatility in mind. Each pair boasts rich and colorful designs, in tandem with memory foam-lined toe pieces, firm arch supports and soft-squeeze mid-soles, making Hari Mari flip flops an easy fit for wearing on-the-go in the city, at rest on the beach or anywhere in between. "When looking for a nice flip flop that offered a little more than your traditional brown or black look proved repeatedly unsuccessful, we decided to develop and create our own line," says Stewart, Hari Mari's founder. "We designed Hari Maris to be crisp, timeless and super comfortable, creating a color-injected line for people on-the-go who want a quality-made flip flop as unique as themselves." Hari Mari donates $3 for every pair of flip flops purchased to help kids with pediatric cancer secure treatments & medicines vital to their fight. This month, however, the company is donating $6 of every flip flop purchased to Cook Children’s to assist the families and patients served by the hospital’s new cancer center. Hari Mari Shoes retail for $60 and are available at www.HariMari.com and select independent retailers. To learn more about Hari Mari or for style inspiration find the brand on Facebook at www.facebook.com/harimarishoes. The shoes are in stores throughout Dallas, as well as in Austin, Lubbock, Fort Worth, and various other Texas cities. At the rate they are expanding, they may be in stores across the U.S. within a matter of months.